Become a patron! Get rewards! Keep independent artists independent! Get rewards, behind-the-scenes content, access to the process, and more when you become my royal patron on Patreon! Keep independent music, film, and art independent! 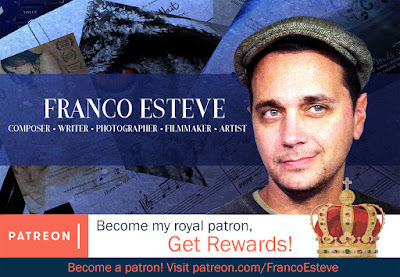 Like other artists, I've joined Patreon, the service that allows you to be a royal patron of old and support independent artists like myself through crowd-funding and micro-payments. Patreon allows you to participate in the great tradition of the royal patrons of old. I'm your Beethoven, your Da Vinci. Ok, not even close, but I'm your artist, and you'll join me in my journey of creation, getting access to my creative craziness, drafts, art, photos, films, and music, lots of music. Producing music, films, and art costs all kinds of money, from equipment to software to food and people. You can participate. You can be part of the process. You can be the fuel that feeds the artist! You'll feed my creativity by freeing me to create! What do you get when you become my royal patron? You get to feel good because you ARE a royal patron of old, sponsoring an artist's work. Access to the process: Drafts and previews of writings, films, unedited content, sheet music, recordings, photos, art, etc. Access to the artist: Access to me, to how I do it, to where it comes from, etc. Participation: You get to participate in the process as I include you in my journey of creation. You get to hear from me directly, and will be able to interact with me and my work. You get to free the artist to create. Costs go way beyond cost of living to include audio engineers, equipment, instruments, software, all kinds of hardware, way too many hard drives, cameras, crew, actors, food, film festivals, production, etc., etc., etc., so your patronage frees me to dedicate myself to my arts.